Earlier this week I mentioned that I had been making mini pies using this pie crust recipe. 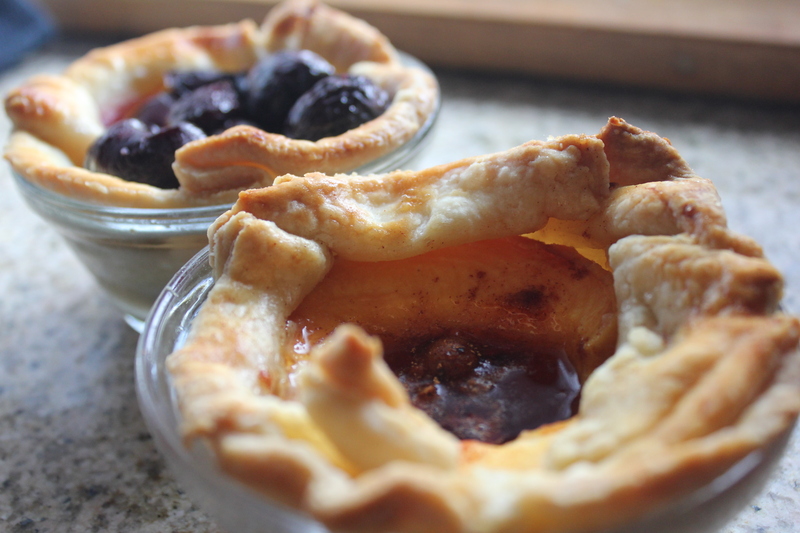 Last week I made peach and blueberry mini pies. Today I tried my hand at strawberry and cherry in addition to peach. Previously I had just been making a “pocket pie” by folding the dough around the fruit filling. This works especially well for the peach pie where I simply cut a peach in half and filled the hole where the pit was with the sugar mixture. This time I baked them inside of custard cups to make a true mini pie. This helped to keep the smaller fruits and their juices contained. Recipes for each of the pie fillings are below. Each recipe is enough for a full 9-inch pie or 8 mini pies. I glazed the crust with a large egg before baking at 375 degrees for 35 minutes. In a large bowl, sprinkle lemon juice over blueberries and toss to coat evenly. In a small bowl, stir together sugar, cornstarch, lemon zest, salt and cinnamon. Sprinkle the sugar mixture over the berries and toss to coat evenly. Transfer into a pie crust. Dot with small pieces of butter. In a large bowl, sprinkle orange juice over strawberries and toss to coat evenly. In a small bowl, stir together sugar, cornstarch, orange zest, salt and vanilla. Sprinkle the sugar mixture over the berries and toss to coat evenly. Transfer into a pie crust. Halve the peaches and remove the pits. Scoop out a little extra flesh if needed. Mix brown sugar, salt, cinnamon, and nutmeg together in a small bowl. Spoon about a tablespoon into each peach half. Pack in as much as you can into the center of each peach. Dot the top of each with a small piece of butter. In a large bowl, sprinkle lemon juice over cherries and toss to coat evenly. In a small bowl, stir together sugar, cornstarch, and salt. Sprinkle the sugar mixture over the cherries and toss to coat evenly. Transfer into a pie crust. Dot with small pieces of butter.